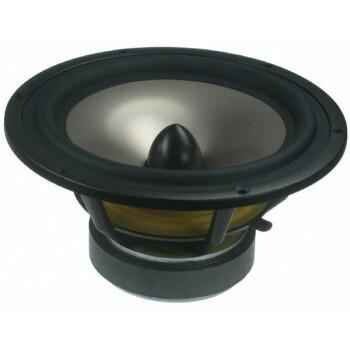 SEAS L22RNX/P H1252-08 is an 8" woofer, with superb bass extension response. An extremely stiff aluminum cone gives tremendous bass precision and extension. No sign of the familiar cone edge resonance and distortion associated with soft cones. The extremely long high temperature voice coil wound on an aluminium voice coil former gives a high power handling capacity. SEAS L22RNX/P HH1252-08 is an 8" woofer, with superb bass extension response. An extremely stiff aluminum cone gives tremendous bass precision and extension. The cone and the low loss rubber surround show no sign of the familiar cone edge resonance and distortion associated with soft cones. The extremely long high temperature voice coil wound on an aluminium voice coil former gives a high power handling capacity. The phase plug reduces compression due to temperature variations in the voice coil, eliminates resonances that would occur in the volume between the dust cap and the pole piece and increases the power handling capacity. The large magnet system provides medium/high efficiency and low Q. An extremely stiff and stable injection moulded metal basket keeps the critical components in perfect alignment. Large windows in the basket both above and below the spider reduce sound reflection, air flow noise and cavity resonance to a minimum.